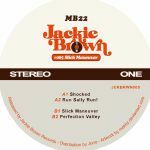 Review: After four volumes of smoking hot disco house business from El Nino, Jackie Brown turn their attention to debutant producer MB22, who understands the party-starting manifesto of the label intrinsically. "Shocked" kicks the record off in a flurry of heated chops and licks, all driven by a nagging hat, and then "Run Sally Run" switches stance to a winsome 80s tinged electro jam, tape-hiss included. "Slick Maneuver" takes things into smooth, boogie-indebted territory and then "Perfection Valley" rounds the record off with the kind of dusty electro funk that Moon B made his name with.